I have wanted a new tattoo for a long time. I've had ideas for different elements of it dating back for years, but the idea coalesced only in the last couple of years. I have a rule that I have to want a specific tattoo for a year before I am allowed to get it. This prevents me from listening to my impulsive mind and then cursing Past Jean in three months when I no longer think a rash tattoo decision was a good idea. You know how Past Jean makes rash decisions. It's a known thing. Anyway, I finally had my idea and then it turns out that when I contacted tattoo artists back in April, no one could get me in until October when I had my consultation and then finally last Thursday when Fernando at British Ink gave me my tattoo. I love it so much. Soooo much. It's really pretty. AND he spelled every word correctly. That pink splotch on the floor is from when Fernando spilled hot pink ink all over himself and his stuff just prior to inking me. I gave him the benefit of the doubt regarding his motor skills because I’m also clumsy but good at my job. This tattoo is crammed full of symbolism and significance and I am about to tell you all about it, so read on if you're interested and know that if you're not interested and stop reading here, you won't miss all that much. The song lyric there is from Bob Dylan's "Tangled Up In Blue." I love that song and I love that lyric, which, in its entirety, is, "The only thing I knew how to do was to keep on keepin' on like a bird that flew." (Hence the bird.) 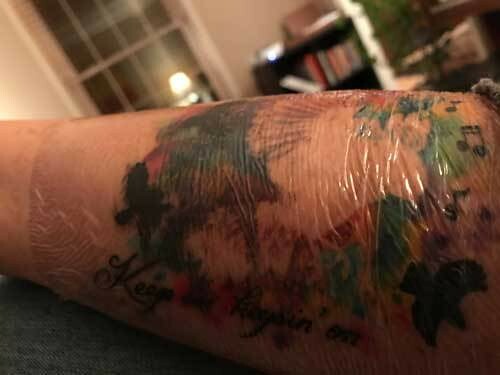 I think that keepin' on is a nice encouragement to have on my arm where I can see it whenever I want to. I'm very pleased with the first words I've chosen to put on my person. I knew that I wanted a bird, but i had to decide what bird. I considered a hummingbird, but apparently hummingbirds are kinda assholes and no matter how fitting that might seem and how pretty they are, I decided against them. 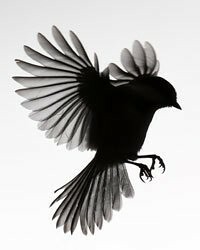 I ended up looking for symbolism in birds and found that the chickadee has some nice symbolism, at least according to this one obscure website I found. Plus they’re super cute and fluffy. I especially like the part about being happy in the self, which is what I was going for with my design. Which leads me to why I chose a negative space bird instead of having Fernando actually ink the bird. That space represents a Stimey-shaped space for me in the world. That was inspired by Tom Petty's song "You Don't Know How it Feels," in which he sings, "Think of me what you will, I've got a little space to fill." Plus I found this great shot of a chickadee that was perfect for my purposes. I especially love the feet. 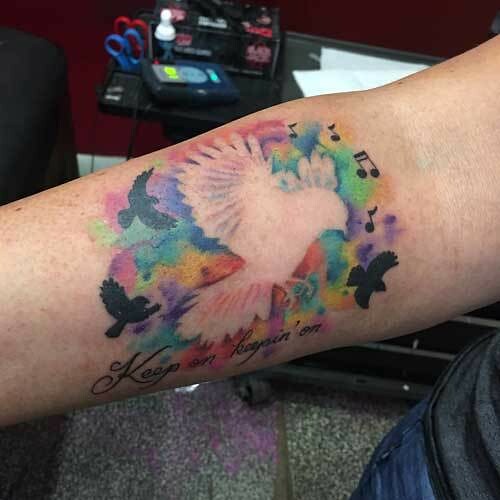 I knew that I wanted to get three birds to represent my three kids. They are not negative space because I wanted to show that they are like me, but they are their own people. I knew I wanted Alex in there too, but wasn't sure how to do it. I asked Fernando and after I told him a little bit about Alex, especially his love of music and concerts, he suggested the music notes. Perfect! The colors are because they are pretty and also because they include colors from all over the spectrum, which has all kinds of happy connotations. If you're not into symbolism, it's also just a pretty bird. So it has that going for it. The tattoo is currently wrapped in some sort of plastic until Monday, so it's not at its best. I'm looking forward to unwrapping and washing it. The plastic draws up the ink a little so it looks blurry. It’s kind of a fun effect. It is always a little scary to get a new tattoo. No matter how much you have thought about it, it's a big deal, especially when it is someplace so visible. 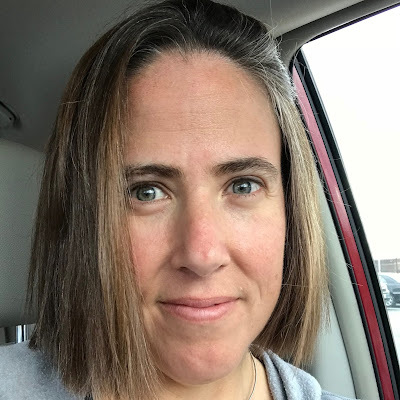 Also, since I haven't gotten a tattoo for 20 years, I was worried that I might have wussified in the intervening years and not be able to handle the needles. Turns out I'm just as tough now as I was then. Yay, me! I couldn't be happier with my result. Fernando really listened to me and worked hard to make sure I got what I wanted. He was really nice too. I wholeheartedly recommend him. I'm also starting the clock for my next tattoo. I'll tell you all about it in a year (or two or three). Yay, you! And your pretty, new tattoo. Oh, that's gorgeous! I'll definitely be taking this to my artist as inspiration. "Colors and a silhouette like this, but these different birds, and can we work a red-winged blackbird in there somewhere?" Also, I'm having a feeling of amused recognition that you also have a personal 12-month tattoo clock. My spouse and I both operate that way. Jean!!! The negative space is brilliant and so perfect for this! Love the pieces you put together for this tattoo. I love it! I love all the symbolism and how it all comes together as one gorgeous piece. Oh Stimes it's beautiful and perfect. Who knew a chickadee was an actual thing! ROYGB(IV)!! Yay for a new tattoo! I like your idea of waiting a year on a design before getting it; I've been looking for a way to decide when it is Time To Act on an idea. I love the design, what a unique piece! Live out loud. I saw the music notes, and immediately thought "3 kids, 3 notes; and a double-note (16th note) linking you and Alex together." I don't know if that's what you had intended, but it absolutely works.